All vegetables are good for your health, but kale -- a cruciferous plant which belongs to the same family as broccoli, cauliflower and cabbage -- is particularly outstanding. The leafy green is a rich source of vitamins A, K and C, fiber, carotenoids and flavonoids. You don't have to get out pots and pans to enjoy kale. It's delicious in raw form, but be sure to remove the tough stem at the middle of the leaf. Kale is available in raw form in both the summer and fall. Look for kale with crisp leaves and firm stems. Fresh kale can range in color from purple to dark green to red, so base your purchase on the condition of the leaves. Young plants may be preferable for raw consumption as the leaves will have a milder flavor. You can munch on raw kale leaves for a snack or use them as a base for a salad. Toss thinly sliced kale leaves with diced apple, dried cranberries and a vinaigrette dressing. Sweet ingredients are a good counterpart to the bitterness of raw kale. You can also prepare a simple slaw with finely sliced kale, carrots, apples and low-fat plain yogurt. Kale is a nutrient powerhouse, but for some, the leafy green is dangerous. 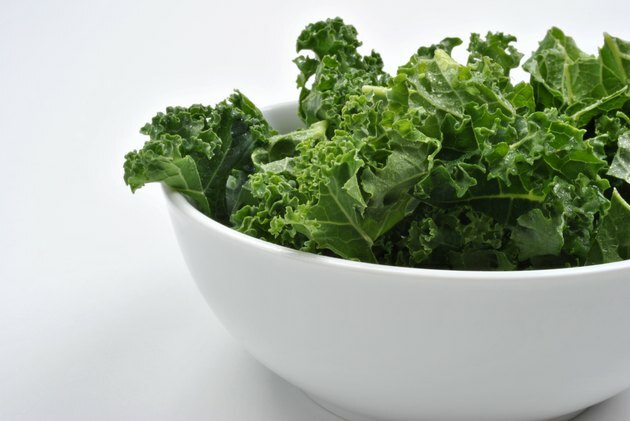 High quantities of vitamin K in kale are problematic for anyone taking blood thinners. If you are on warfarin or similar medications, consult your physician before adding kale to your diet.